Photos From The NCAA Division I Men’s Ice Hockey Midwest Regional. Here are some of my favorite photos from the NCAA Division I Men’s Ice Hockey Midwest Regional at the Resch Center in Green Bay, Wis. this past weekend. North Dakota defeated Denver to advance to the Frozen Four in St. Paul, Minnesota next weekend. I was happy with the action photos I came away with even though I only photography hockey every few years. The regional comes back to Green Bay in 2012 and hopefully I will find myself photographing the event again. North Dakota's Brad Malone scores on Rensselaer's goalie Allen York. North Dakota's Chay Genoway battles for the puck with Rensselaer's Jeff Foss as goalie Allen York defends. 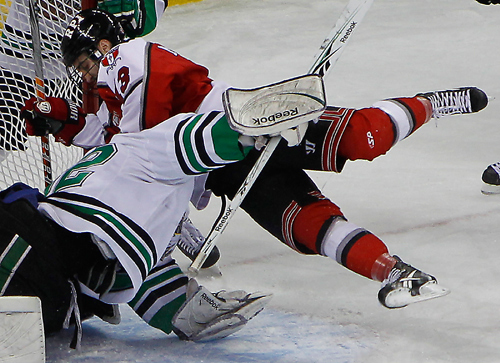 North Dakota's goalie Aaron Dell and Rensselaer's Joel Malchuk get tangled up. 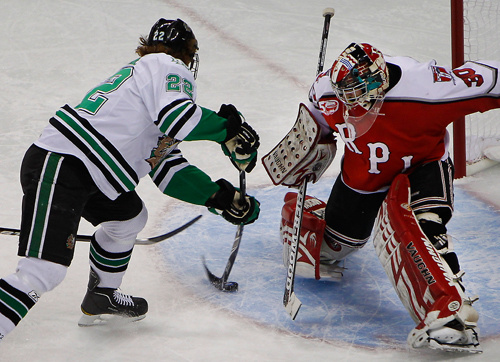 North Dakota's Brad Malone tries to get a shot past Rensselaer's goalie Allen York. North Dakota's goalie Aaron Dell defends a shot by Rensselaer's Josh Rabbani. North Dakota's Brad Malone and Rensselaer's Nick Bailen gets tangled up. Western Michigan's Ben Warda's shot gets stopped by Denver's goalie Sam Brittain as Drew Shore helps defend. Western Michigan's goalie Jerry Kuhn looks for the puck in a battle at the goal as Denver's Nick Shore comes in. Western Michigan's goalie Jerry Kuhn lays on the ice in dejection as Denver's Luke Salazar celebrates the Broncos win in double overtime. Western Michigan's goalie Jerry Kuhn is consoled by Luke Witkowski as Trevor Elias (21) and Dennis Brown (11) stand dejected in the goal after losing 3-2 in double OT. Denver's Anthony Maiani battles with North Dakota's Derrick LaPoint, left, and Danny Kristo. Denver's Anthony Maiani can't get a shot past North Dakota's Aaron Dell. Denver's goalie Sam Brittain can't stop a first period goal by North Dakota's Mario Lamoureux. Denver's Jason Zucker celebrates his first period goal against North Dakota. Denver's Jason Zucker consoles goalie Sam Brittnain after Denver lost to North Dakota's 6-1.